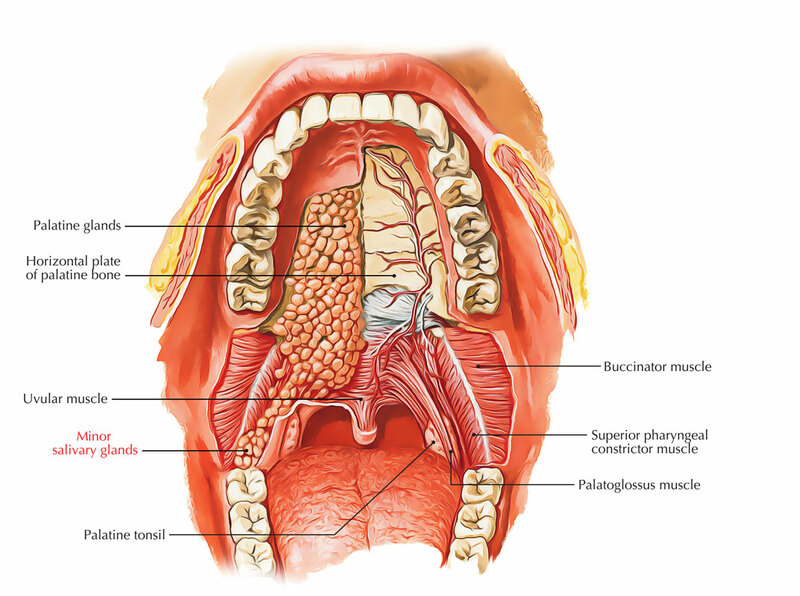 Salivary glands are glands that open or produce into the oral cavity. The majority of salivary glands open into the oral cavity outright or through small ducts and are small glands in the submucosa or mucosa of the oral epithelium lining the tongue, palate, cheeks, and lips. Besides these small glands are much larger glands, that include the combined parotid, submandibular, and sublingual glands. 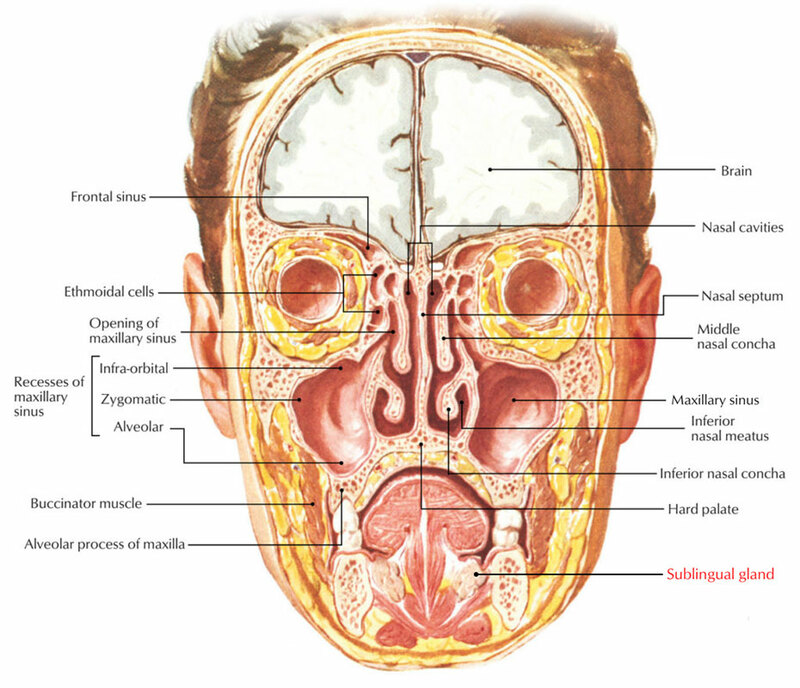 The submandibular glands are much smaller than the parotid glands however they are bigger than the sublingual glands. The larger arm of the hook is outside the limits of the oral cavity and is pointed forward in the horizontal plane under the mylohyoid muscle. On the central side of the mandible (submandibular fossa) under to the mylohyoid line, this larger superficial part of the gland is outright against a shallow indentation. The smaller arm of the hook (or deep part) of the gland enters and lie inside the floor of the oral cavity, coils around the posterior margin of the mylohyoid muscle, on the lateral side of the hyoglossus muscle from where it is lateral to the root of the tongue. The submandibular duct arises via the medial side of the deep part of the gland in the oral cavity and next to the foundation of the frenulum of the tongue.passes ahead to open on the top of a small sublingual caruncle (papilla). The lingual nerve loops under the submandibular duct, going across first the lateral side and after that the medial side of the duct, as the nerve comes down anteromedially via the floor of the oral cavity then rises into the tongue. The sublingual glands are the shortest of the three main paired salivary glands. Every sublingual gland is located outright against the medial side of the mandible where it creates a shallow groove (sublingual fossa) above the anterior one-third of the mylohyoid line. Each is outright sideways to the submandibular duct and associated lingual nerve in the floor of the oral cavity and is almond formed. It resembles that of submandibular salivary gland. 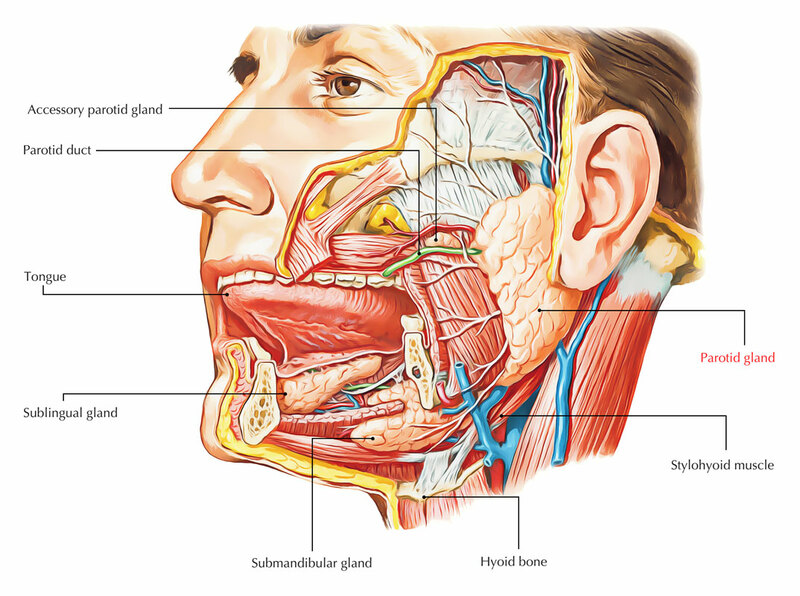 The parotid glands are the biggest of the three sets of primary salivary glands in the head and many structures travel through them. They are anterior to and under the lower half of the ear. Superficial, posterior, and deep to the ramus of the mandible. They expand down to the lower border of the mandible and approximately the zygomatic arch. Posteriorly they cover the anterior part of the Sternocleidomastoid muscle and carry on anteriorly to midway throughout the masseter muscle. The parotid duct exits the anterior edge of the parotid gland halfway in between the zygomatic arch and the corner of the mouth. It goes across the face in a crosswise manner and shifts deeply into the buccal fat pad and pierces the buccinator muscle after going across the medial border of the masseter muscle. It opens into the oral cavity near the second upper molar tooth. The parotid gland gets its arterial supply via the many arteries that go through its compound. Sensory innervation of the parotid gland is supplied by the auriculotemporal nerve that is a branch of the mandibular nerve, this branch of the trigeminal nerve leaves the skull via the foramen ovale. Mucous creating Minor Salivary Glands. Serous Fluid Producing Minor Salivary Glands. The process of lipid hydrolyses in the oral cavity starts when Von Ebner’s gland secretes an enzyme called lingual lipase. The serous secretion flushes matter from the base of papillae in order to enable the taste buds to react swiftly towards the altering stimuli. Mucous secretion functions similar to saliva. Superior portion of tonsils (Weber’s glands). Foundation of tongue (von Ebner’s glands). A salivary gland infection happens when a bacterial or viral infection affects your salivary gland or duct. The infection can arise from minimized saliva circulation, which can be due to a clog or inflammation of your salivary duct. The condition is called sialadenitis. Saliva helps food digestion, breaks down food, and works to keep your mouth tidy. It gets rid of microorganisms and food particles. It also assists manage the quantity of good and bad microorganisms in your mouth. A fewer number of microorganisms and food particles are removed when saliva does not easily travels across your mouth. This might cause infection.